Dynamic Predictables' ATLAS climate prediction technology fully models the interactive physics of climate allowing proven, accurate and reliable predictions up to five years in advance. 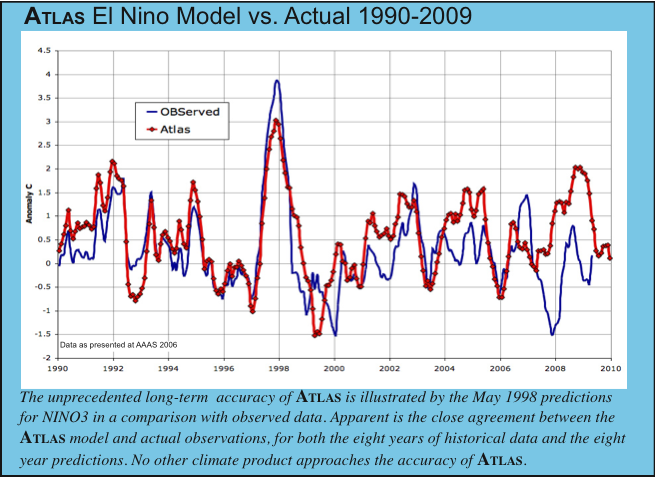 The extraordinary accuracy of the ATLAS long term predictions is due to its unique thermodynamic model which draws upon the fundamental, predictable order of climate processes. This long term order enables ATLAS to accurately predict temperature and precipitation for five full years. ATLAS' current month ahead predictions made five-years ago have been proven to be even more reliable than the same-month ahead forecasts of the National Weather Service's Climate Prediction Center made only thirty days earlier. ATLAS predictions are available in one through five year versions, in standard and detailed models and for regional and site-specific coverage. Contact Dynamic Predictables to discuss which product is right for your needs. forecasting since we started in 2003. On the money!"